Baltimore Decking Companies are less busy: Most people choose to build their new deck in the spring. Because of this, deck builders are often booked solid until the end of summer. There is far less demand during the winter. Less Lifestyle Interruption: A winter deck build tends to cause less lifestyle interruption. After all, you will be spending most of your time inside, unlike spring and summer. Have your Deck ready: You want your deck to be ready when you want to use it. A winter deck build ensures your deck is ready as soon as spring has sprung. If you try to build a new deck in the spring or summer, it might not be ready until fall. 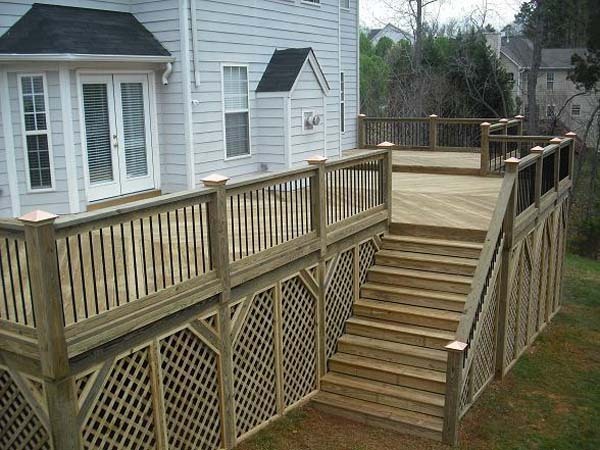 With 40 years of experience, Freedom Fence and Home has built the highest quality decks for its many residential and commercial clients throughout in Baltimore, Maryland and Harford county as well many residential clients in Baltimore county and Baltimore city. Best of all, we do not use subcontractors. We stand behind our work and because we are a smaller company, you will not pay big company prices. First and foremost, we focus on satisfying you, our customers! If you have any questions, please contact Freedom Fence and Home by calling 443-271-6841 or visit our website. And please take a moment to browse our gallery of wood and low maintenance decks. This entry was posted on Tuesday, December 18th, 2012	at 4:14 pm	. Both comments and pings are currently closed.